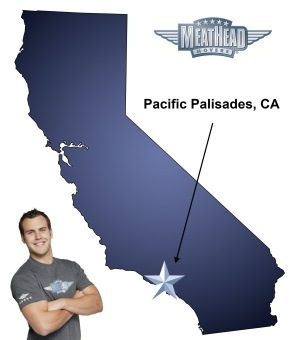 If your future in Pacific Palisades includes a move, check out Meathead Movers! Our Pacific Palisades movers are professionally trained student-athletes, and our moving concierge and Princess Packers are dedicated to getting you safely moved into your new home. It can cost a small fortune to reside in the gorgeous Pacific Palisades area of Los Angeles. At least your moving day can be affordable, if you choose the right Pacific Palisades movers. Pacific Palisades is, as the locals say, ‘where the mountains meet the sea.’ Due in part to its proximity to Hollywood and partly because of its remarkable beauty, Pacific Palisades has been featured in many movies, television shows, and music videos. For instance, the 1976 movie Carrie, based on the Stephen King book, was filmed at Palisades High School. The hilarious HBO series The Larry David Show is filmed in David’s real-life Pacific Palisades home. Whether you’re moving to this privileged enclave for the first time or you’re already a resident and are simply changing addresses, we are the Pacific Palisades movers to hire. Meathead Movers is a very special moving company and we offer services that other moving companies may not be able to provide. Our moving company specializes in local, long-distance, and commercial moves to, from, and within Pacific Palisades. We also provide reliable packing, storage, on-site relocations, and our distinctive moving concierge service, which connects you with local service providers. Every Meathead crew member is well-screened and background checked prior to being hired for employment. Our crews are comprised of clean-cut student-athletes who are dedicating to providing fast and efficient service. In fact, they will even jog while not carrying your items. As soon as you know you’ll be making a move, give us a call at 866-843-6328. A cheerful crew of Pacific Palisades movers can make a world of difference on moving day. We’d be delighted to give you a free, no-obligation price estimate. Moving to Pacific Palisades? Here are some helpful resources. View more Pacific Palisades resources. Very professional, friendly, hardworking overall very pleased with the service! Great work! These guys walk the talk! Outstanding hard working employees with integrity.